A deeply rich, amazingly smooth and historic Bourbon returns to the US and the world. Issac Wolfe (I.W.) Bernheim famously came the United States in 1867 with $4 cash to his name and the clothes on his back. He got a job as a bookkeeper for a liquor company and saved his pennies, eventually opening his own distribution business in 1872. Soon, he was distilling and bottling his own brand of premium Bourbon under the I.W. Harper name to avoid confusion with his Bernheim Distribution business. For decades, all I.W. Harper Bourbon was exported. But a few years ago Diegeo purchased the company and has now returned this historic and tasty Bourbon to its original market and made it available in the United States once again. I.W. Harper 15 Year Old is just really really good. Let’s start with the basics. The mash bill is 86% corn, 8% malted barley, and only 6% rye. And yes … the center-cut spirit is aged a full fifteen years in new American white oak. If you are a Bourbon fan, those numbers tell you the entire story. It’s perfectly sweet, very smooth, and has a fruit-forward character and just a hint of spice that holds your interest. It’s a lovely dram best sipped and savored neat. Enjoy. What does I.W. Harper 15 Year Old taste like? The Flavor Spiral™ shows the most common flavors that you'll taste in I.W. 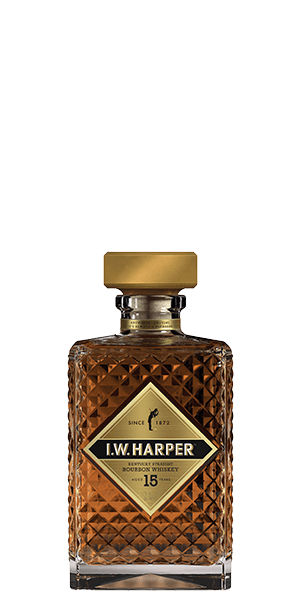 Harper 15 Year Old and gives you a chance to have a taste of it before actually tasting it. Bright, lush with fruit aromas with orange marmalade rising to the top. More complex fruit notes that open up to dark chocolate and leather. Long, with solid warmth and oaky notes. I really wanted more from this given the price but the bottle os cool. Very smooth and sweet to start. Can taste a bit of citrus at first, then turning to a nice long, spicey, sweet finish. A good bourbon to sip on neat. I love how this tastes. Let the air touch it for awhile and it gets better. It has a little punch at first, too. A must if you drink bourbon. Smooth and delicious. One of my favorites. Super clean and smooth, almost too smooth. A very nice neat whiskey. Very nice nose, you can really smell the honey. The first taste is strong, but not lingering. Very distinctive sweetness at first, followed by a nice warmth. A clean finish that doesn't leave any aftertaste. Smooth. Expensive but great addition to bar. This is different and special bourbon. I love it. It has a very distinctive nose of roasted peanuts and toasting marshmallows. Palate is extremely smooth, with subtle flavors of caramel and a whiff of pine, overripe persimmon, with a pronounced and constant symphony of cocoa dust. And to be honest it is a bit of an oak blast. With bigger sips, a cherry note emerges and wonderfully dominates. The finish just keeps delivering with mild spices, milk chocolate, and sweet corn. Creamy, dreamy and unique, I will definitely be coming back for more. Highly recommend. Very unique. Hunker down and fight through the oak like a man, to enjoy the more subtle aspects of this one. Smooth and for the price one of the best whiskey. Even the standard IW Harper is good enough to get the job done. Very smooth and warm finish, an excellent addition to my bar! First of all the decanter is gorgeous, however, what's inside is even more impressive. Very smooth with hints of fruit. It's best served just over ice. Mixing it would be a sin. This is delicious! Definitely try it! My new favorite. I’m going through this too quickly. Of all the bottles of Bourbon in my bar, I secretly whisper “You’re my favorite” to the I.W. Harper. Outstanding!!! Very Smooth. Excellent finish. This was highly enjoyable! I definitely would recommend this for someone looking for something to sip on. Stiff, a bit astringent aftertaste. Tastes a bit stale. A bit smokey. My wife bought a bottle of this for my birthday and I absolutely love it! Very Smooth! Oh my, I do love this one. Quite Smokey and smooth, it wears the 15 years on its shoulders in all the right ways. Great sipping (neat)! Super smooth. Very enjoyable nose.